It all started with the Raspberry Pi as a Christmas present, and we started with the Raspberry Pi Education Manual as our guide. As a free download, it was a very good primer to get started. Then we moved onto other books, such as Getting Started with Raspberry Pi, and I started to notice some patterns. 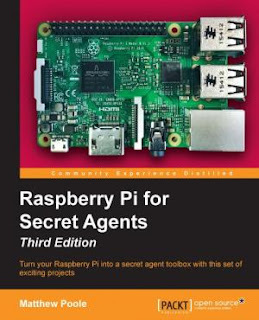 Those books often covered the same things over and over: getting the system to boot with Raspbian, visual programming with Scratch, and using the GPIO pins. Also, I noticed that the books focused on how to use the disparate features of the Raspberry Pi, but they didn’t have a common goal or theme in mind. Both of these observations led to my next observation that my daughter’s excitement in Raspberry Pi books started to wane because it felt like we were slogging through math textbooks as opposed to reading with an exciting goal in mind.